We’re proud to announce that we are one of promoting partners for the #CivicTechFest, Asia’s first Impacts of Civic Technology Conference (TICTeC@Taipei) alongside WCIT 2017. Join us for from September 11th in Taipei, for the week-long festival around Civic Tech, Open Data and Open Government movements! Come join us with g0v, Code for All, Asia Open Data Partnership, Wikimedia, OpenStreetMap, OGPToolbox and OpenDemocracyNow and 200+ enthusiasts! 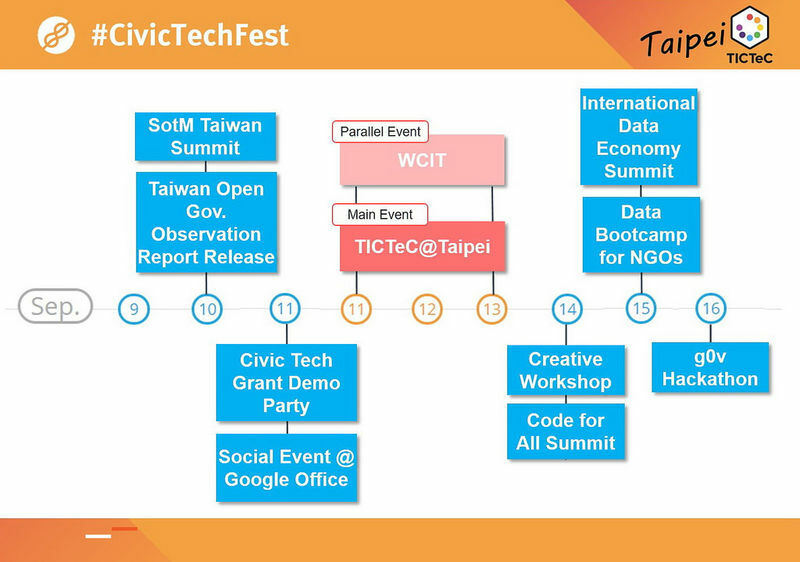 It’s a unique opportunity to showcase open government and civic tech initiatives to the wider IT industry, and connect the global civic tech network in Asia’s main civic tech hub, all start from 11th Sep in Taipei.